Inspired to further develop our cross Trust working, in December 2017, supported by a grant from the Regional Schools’s Commissioner to build capacity, we held a training day at Old Trafford bringing together all the teachers and support staff from our three academies, along with staff from our partners, the Manchester United Foundation. It seemed apt that for our first whole Trust training event, the subject in focus was Growth Mindset! Although all three academies had done a certain amount of work around Growth Mindset, we felt that given the current climate which is particularly challenging for young people in our schools, with the move to linear exams and all the competing demands of 21st century living, that this would be a topic which could engage all staff and benefit our students. 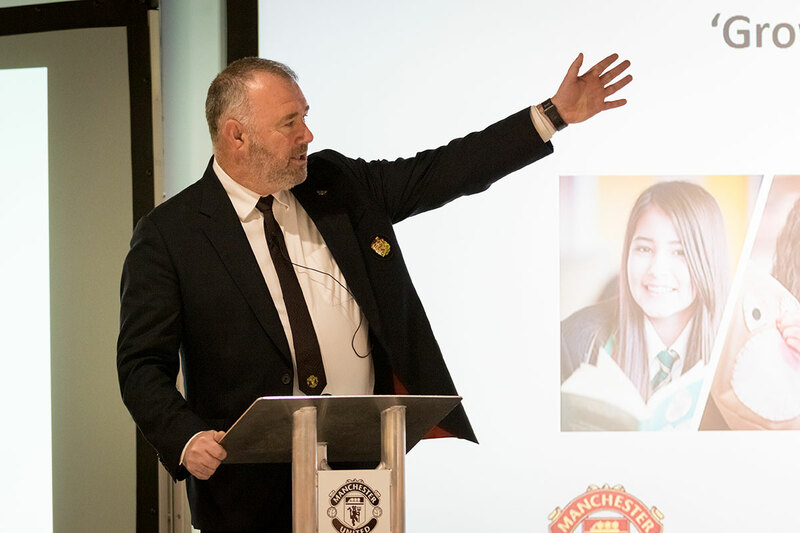 We wanted to bring our 350 teaching staff together at an iconic venue in the city to facilitate quality learning time together off site and develop our partnership working and shared vision. We were lucky to secure Chris Hildrew as one of our keynote speakers. 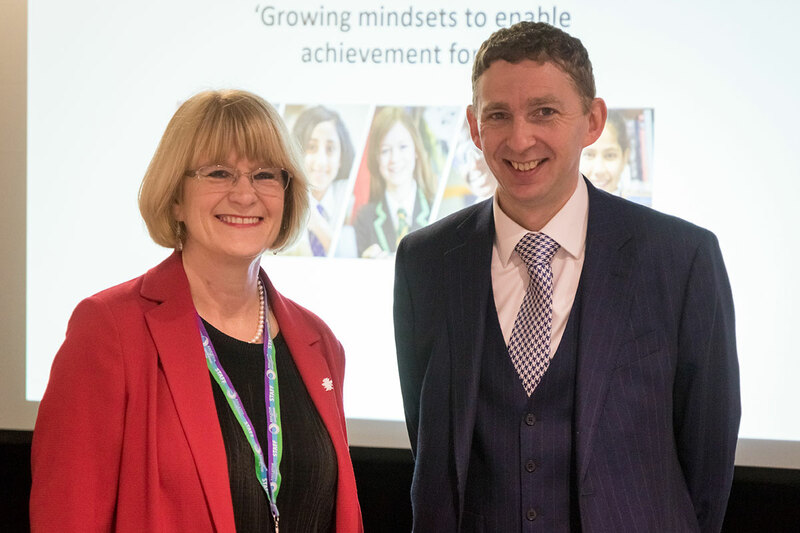 Chris, Headteacher of Churchill Academy and Sixth Form, whose book Becoming a Growth Mindset School: The Power of Mindset to Transform Teaching, Learning and Learners is out in March 2018, honestly shared his school’s Growth Mindset journey. His input had insights for everyone, however familiar they were or were not with Dweck’s key concepts. He shared the successes of some of the different strategies he has trialed whilst openly acknowledging some of the pitfalls. Chris highlighted the dangers of too superficially applying Dweck’s work, expecting to secure a change of Mindset through well meaning assemblies and poster campaigns and set us thinking about more fundamental changes, building in curriculum time for struggle and no longer grading work, relying instead on quality next step feedback. 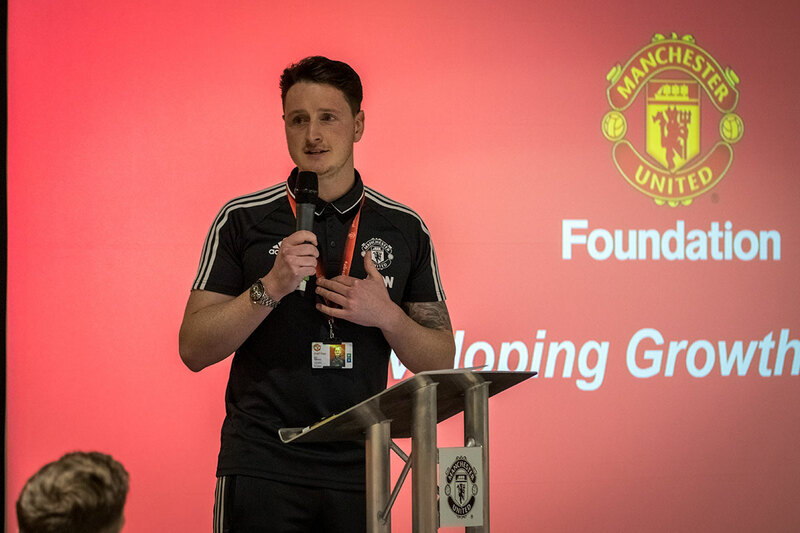 John Shiels, CEO of the Manchester United Foundation introduced us to of the work of the Foundation, sharing how Growth Mindset is applied in football, management at the club and in the Foundation’s work with young people. Three highlights were inputs by our students, the fantastic East Manchester Academy choir’s moving rendition of ‘Titanium’ set the tone for the day, reminding us of the power of the inner voice, members of Whalley Range’s Student Senior Leadership Team shared their own perspectives on Growth Mindset with articulacy and passion and, supported through the questions of Jason Williamson, our Manchester United Foundation Hub Officer, students from Levenshulme and Whalley Range who have faced barriers to learning voiced their struggles to adopt a Growth Mindset and change the perceptions of adults working with them. All participants were challenged to adopt a Growth Mindset, engage and reflect through our fun ‘we are the choir’ activity, led by our charismatic conductor, Chris O’Hara who had us singing in different languages and mimicking animals and Gemma Howell’s creative art activity which produced vases of annotated flowers on every table telling the story of our thoughts about Growth Mindset! 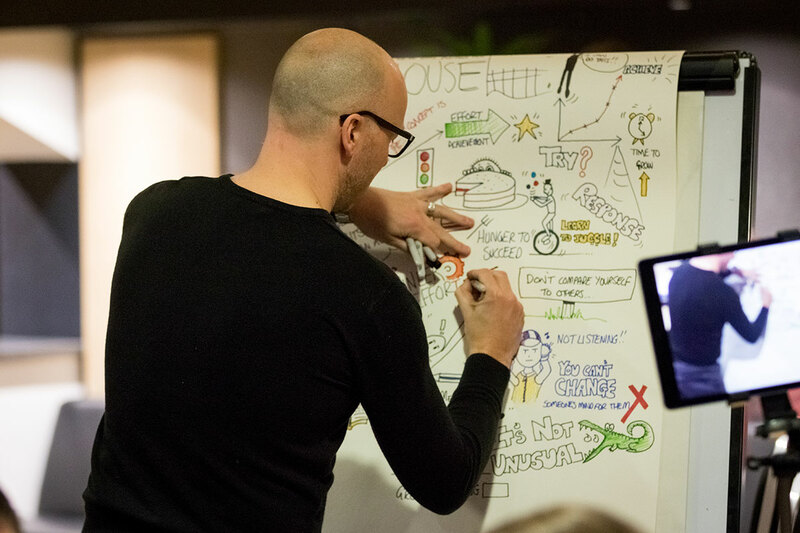 Everything was captured through photos, film and in an amazing frieze of the day, drawn by our resident artist, reprographics and media manager, Justin Eagleton. Feedback from the day was overwhelming positively with staff really appreciating the opportunity to get together off site and learn more about ideas which could have significant impact for the young people we work with. We will continue with our work on Growth Mindset in the months ahead and are already planning a date for next year! And of course, we hope to get a group down to Churchill Academy to see Chris’s strategies in action! Flip learning resources were circulated to participants to ensure everyone was ready to access the day’s content.